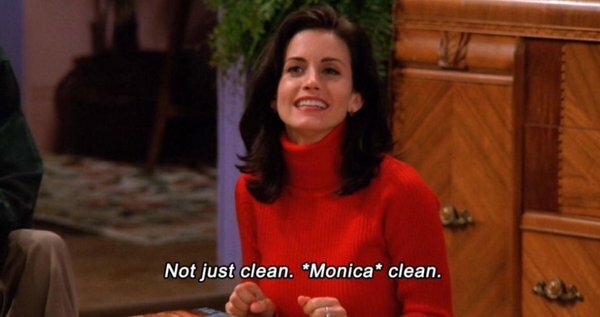 Unless you are Monica Geller from FRIENDS, cleaning is something that most of us would probably rather not deal with. It's time consuming, expensive, and there are plenty of other more appealing activities that vie for your attention, like binge watching your favorite show on Netflix. While Netflix is definitely more desirable, sometimes you have to crawl out of your blanket-laden couch cocoon and be an adult. That said, being the above-stated responsible adulting does not have to cost you a fortune. There are tons of cleaning supplies out there that cost an arm and a leg because they are “trusted” brands, “environmentally friendly”, or come in a “convenient new package”. But don't be fooled. You don't need all those bells and whistles to keep your house clean. Just keep it simple! You'd be surprised at how effective and money conscious you can be by just sticking to some basic staples. Not only can cleaning supplies be expensive, but many of them are also filled with harmful chemicals. Some of these incredibly popular cleaners can be toxic to both your kids and pets. So why not opt for a more natural approach by creating your own household cleaners? The primary cleaner that we use in our house is vinegar and water. This is something that my mom and grandma used in cleaning their homes, and I am a firm believer that you can use vinegar and water to clean just about anything. 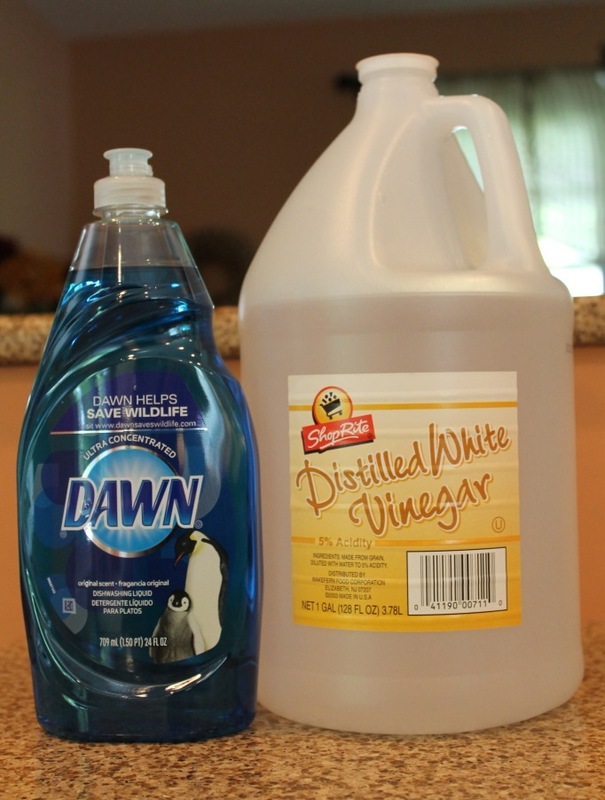 A 50/50 mix of distilled white vinegar and water is perfect for cleaning counters, sinks, glass, floors, you name it. The low pH in vinegar allows it to effectively kill germs and bacteria (although it took me YEARS to convince M$M of that) and the price is phenomenal. Another cleaner that I often use for jobs that are a little tougher is what I call “the blue stuff”. This cleaner is a mixture of Blue Dawn and VINEGAR (did I mention I love vinegar)! The Dawn dish soap gives this cleaner it's power, allowing you to get off the stuck on gunk and grime. The tutorial recommends using “the blue stuff” on bathroom sinks and showers, but we also use it on the baked-on gunk in the oven. Spray it on, let it sit for a couple of minutes, and scrub it will some some steel wool–that baked-on gunk will slide off like butter! When I'm getting down and dirty with my vinegar and water and “the blue stuff”, I always use washable rags. For most it is a lot easier to reach for a roll of paper towels when cleaning, but I'be realized that it's such a waste! I have stash of cleaning rags under my sink to use when cleaning and I always make sure to put them in the laundry room when I am done so they are washed and ready for the next time. One more reusable cleaning supply that can save you a lot of money in the long run is a microfiber cloth for dusting. When I was in college, I always tried to go the easy route in cleaning and I blew through a ton of those over-priced disposable dusters. It seemed harmless at the time, but countless $4 boxes of those bad boys really began to add up. Luckily I eventually saw the error in my ways and now use ONE washable microfiber dusting cloth that I just threw in the washing machine when it gets dirty. I'm sure most people would prefer to have more than just one, but hey, I'm cheap. Reduce, reuse, repurpose– not only does it help the environment, it saves you money too! I would venture to guess that most people through away those hundreds of plastic bags you get at the grocery store, who has use for that many plastic bags anyway? The answer– frugal people do! The frugal-minded are always looking for any way to pinch another penny. As my uncle always says of my grandma, “She can squeeze a quarter out of a nickel.” So I guess I learned from the best! That being said, I don't remember the last time I threw away one of those plastic bags. I have a stockpile of them and I use them for lots of different purposes. In our house they mainly get used for scooping the litter box, but we also use them to line small trash cans, to tote items to various places, and as padding when packing things in boxes. There are also numerous lists online for varying ways to use plastic bags if you are looking for a way to practice your frugalness. Other items around your house that you can reuse for cleaning purposes are old cups. They are great to use for rinsing tubs and sinks, or watering the plants. Old towels or shirts also work well for reusable cleaning rags. If you use these instead of buying washable cleaning towels, you can be extra thrifty! Following these simple tips can help you save a ton of money on cleaning supplies in the long run. What are simple things that you do to save money around your house? Great tips! I’m ready to channel my inner-Monica and start cleaning (cheaply)… Or maybe binge watch Friends on Netflix :)! I make my own disinfectant wipes with squares of old t-shirts stored in a jar with 1 cup of water, 1/4 cup of rubbing alcohol, and a squirt of Dawn detergent. They clean really well and I toss the rags in the wash. A great use for worn out t-shirts.